Building a business is easy. Start with an idea. Find a wicked developer who is willing to work 80 hours a week for small paycheck and equity. Spend some time on Sand Hill Road. Hire smart people and then watch your bank account grow. Building a social business is not so easy. It requires people to actually communicate — processes and governance models that help shape employee behavior online — and technology to facilitate collaboration across the organization. 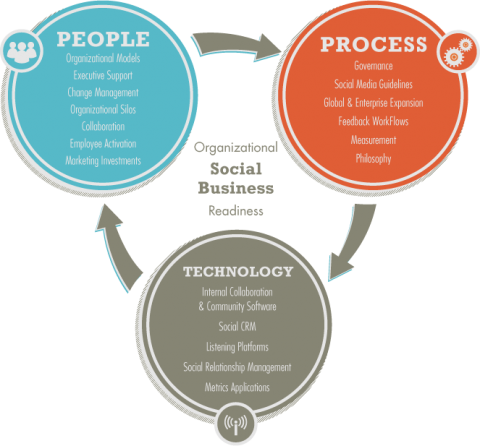 A social business is built upon three pillars – people, process and technology. All three need to work independent of each other, yet need to be completely integrated into the DNA of organizational culture. The foundation of a fully collaborative social business, whether for a small or large firm is the company’s most valuable asset, its people. It addresses the need to drive organizational change in an effort to shift employee behavior, communicate more effectively across job functions and geographies and tear down organizational silos. All the technology, collaboration software and community applications deployed behind the firewall will not be effective unless there is a fundamental shift in the way employees think, interact with one another and communicate. These change management initiatives have to be driven by organizational leadership and practiced at every level in the organization from senior leadership all the way down to a customer support agent. Otherwise, change will not occur. This means that executives must not only talk about changing the organization but exemplify the behaviors that really do facilitate and practice change. The end result is an increase in trust among all employees at every level; trust of employees and empowering them to engage externally; an increase in budget investments to social business initiatives, collaboration and more effective social organization models. Process cuts right through the entire fabric of the organization. It ensures that every job function in every business unit and within every geography is consistent when performing certain tasks. For example, when a new employee joins a company and wants to start blogging or Tweeting on behalf of the company, a process should be in place that governs training, certification and social media policies. Another example is when marketing departments in other countries want to create a Facebook fan page specifically for their geography. A process should be in place that will manage the creation of new social media destination; and escalate these requests to governing body (i.e. Social Media Center of Excellence) to avoid duplicate pages and inconsistent messages. Processes should help facilitate the chaos that exists from behind the firewall – i.e. employees sharing sensitive material externally, social media ownership, crisis management and product feedback workflows; and ensuring there is one measurement philosophy that the entire organization is bought into and using for reporting. Additionally, training initiatives, social media policies and guidelines, moderation policies, global expansion must be documented, approved and then rolled up into a co-created governance model. This ensures that there is message consistency globally, a legal documentation that protects the organization, empowers employees and ensures that everyone is on the same page. A social business needs technology in order to facilitate change and collaboration. Organizations need to be smart and think long term before investing in technology applications that facilitate internal collaboration (Jive, Lithium, Yammer), social listening (Radian6, Meltwater), measurement (Rowfeeder, Argyle), social relationship management (Sprinklr, Syncapse Platform) and social CRM (Nimble, JitterJam, Pivotal). Companies need to first understand what it is they are trying to achieve before thinking about which technology vendor to deploy. Are they trying to streamline communication between business units or geographies? Are they looking to roll out a collaboration application that will eventually replace their intranet? Or, are they planning to use social CRM and weave it into their sales and marketing initiatives? Whatever the case, it’s important to understand the culture of the organization and its leadership. Technology will not change an organization’s culture. However, having a strong understanding of it will have a huge impact on the technical requirements, choice of technology and how to implement and configure it. The challenge with technology is that there are so many software vendors in the space to choose from. Organizations need to think strategically before making significant investments into technology; and consider scale, integration, support and maintenance costs, and the current suite of applications that are already deployed within the enterprise. The foundation for social business transformation is culture and leadership. All the technology in the world deployed in the enterprise; and all the process/compliance documents created are useless if organizational behaviors aren’t changed. Change starts from the top and business leaders are the ones responsible for facilitating this change. Michael Brito is an Adjunct Professor, TEDx speaker, and Executive Vice President at Zeno Group. His next book, Participation Marketing: Mobilizing Employees to Participate and Become Brand Storytellers, is set to release in March 2018.